It was the most audacious political promise in generations, and so simple you could chant it at rallies. But like a lot of things with Trump, a wall on the border was more about symbolism, not practical sense. I had a boss years ago who said that a goal or mission would never be grasped, let alone followed, unless it was so simple it would fit on a T-shirt. Whatever one may feel about Donald Trump, he is a savant at gut-level marketing. It was “build the wall” that caused his candidacy to catch fire. Among his base of supporters, it remains the reason he is president. So it’s going to be one of the biggest political stories of 2019 that the wall appears to be dead. How can I say that? For starters, his own party doesn’t appear to support it anymore, if it ever did. This week it was revealed that Republicans in the U.S. House opted not to roll out a wall-funding bill because they couldn’t round up enough GOP votes to pass it (they are still in the majority until January). “(Wall) miles completed yesterday — Zero; miles completed since Inauguration — Zero,” the conservative pundit Ann Coulter tweeted Tuesday, after news broke that Trump would abandon his insistence on $5 billion for the wall this year. The other big tell that the wall is on its last gasp is that some of its backers have started a GoFundMe-style fundraising effort for it. It’s like holding a bake sale for what was supposedly an urgent national-security issue. 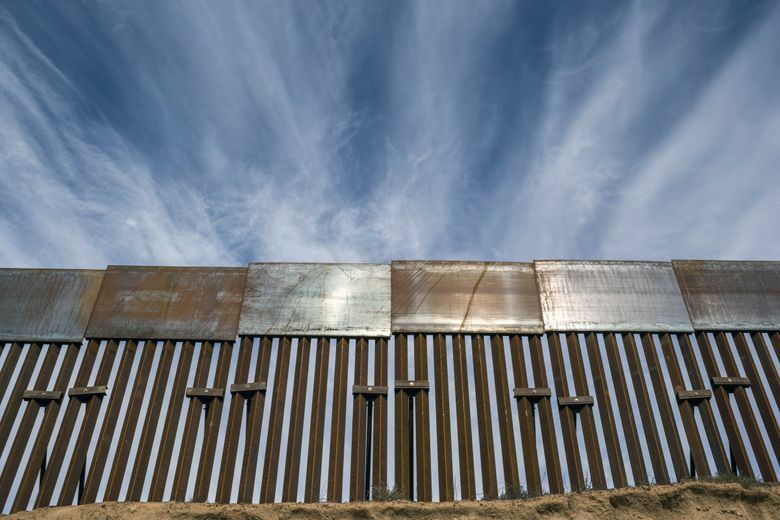 “Based on best estimates of cost per mile, so far we’ve funded 212 linear feet of wall. Please help us keep going!” the site implores, after three months of fundraising. The wall is supposed to be 700 miles long. So at this rate it’ll be fully funded in about … 4,000 years. This was sure easier back when Mexico was going to pay for it. I am interrupted in my mockery though by the cautionary words of reader John Turner of Seattle, who writes that poking at Trump for the “roaring bluster” of his wall may well be satisfying, but it won’t solve any immigration problems. I agree with that. So while I’m no Trump-level marketer, here’s my sales pitch. Liberals, give to conservatives a mandatory E-Verify system, a national database that would be used to vet work eligibility in the country. Yes, the current voluntary system has its data and privacy flaws, but these presumably could be fixed. The beauty of work verification is it could stem a lot of our illegal-immigration issues without the need for any wall. In return, though, conservatives would have to give the undocumented immigrants already here a path to citizenship (yeah, amnesty), and also would have to agree to permit more legal immigration every year than is now allowed. These two proposals fit hand in glove. The main opponents to E-Verify are big businesses and agriculture, because they love the undocumented labor. An example is Trump himself, who was found by The New York Times to be employing undocumented workers at his golf clubs. (Another report found that of the 565 companies in Trump’s business organization, only five are signed up to even use E-Verify.) But if we give businesses a steady supply of workers via an increase in visa programs and more legal immigration, problem solved all around. So that’s my plan. More immigration. Stricter work rules. No wall. OK so that may not quite fit on a T-shirt. Definitely no one is going to chant it at arena rallies. But Trump’s wall never made any practical sense, as most illegal immigration is from people overstaying visas, not sneaking across borders. The wall’s strength is solely symbolic. It signifies nationalism. It means keep out. That building the wall would be a waste of money and wouldn’t keep anybody out has always been beside the point. I think Trump is in as much political peril now from this symbol potentially dying as he is in legal peril from the various investigations. Because the wall is what his base cares about. It’s why he’s president. That thing about setting t-shirt-simple goals — it does make it a cinch to get what the mission is. But it has a flip side. It’s also obvious to all when the mission fails.